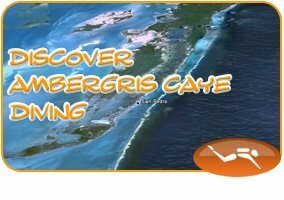 A perfect trip for divers with non-divers to enjoy together. 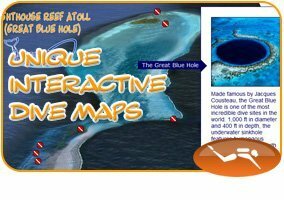 This tour features a 30-foot dive at Hol Chan combined with a snorkeling stop at Shark Ray Alley. Off the southern tip of Ambergris Caye, Hol Chan has flourished into a unique refuge, with robust coral formations and an abundance of marine life. Schools of horse-eye jack, snapper blue tangs, trigger, hog and parrot fish to name a few as over 160 different species of fish identified at Hol Chan. A second stop 5 minutes away , Shark Ray Alley, here, you will feel the excitement and novelty of swimming with large numbers of jubilant Nurse Sharks and Southern Stingrays rays. 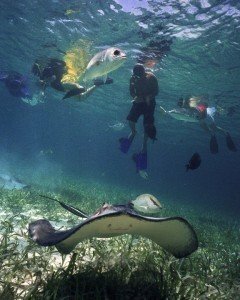 The stags of coral are also home to angel and parrot fish, snapper as well as lobster and spider crabs. Dive Certification Required. All diving includes tanks, weights, belts, and refreshments. Dive Gear Rentals are available +fee applies. Daily at 9:00 am -or- 2:00pm (2 ½ – 3 hrs trip duration).